After a period of significant growth over the past several years, Bovada.lv is now the premier destination for online poker in the United States. Its player volume numbers are greater than any other USA poker room in the market. Click here to visit Bovada Poker now. Keep reading for more information about Bovada Poker and its promotional specials. When you make your first deposit at Bovada, you’ll automatically qualify for a 100% up to $500 poker bonus – with no bonus code needed. When you go through the depositing process, you’ll have your choice between several casino and sports bonuses. But whichever of them you choose, you’ll also be credited with the poker bonus as a matter of course. You have 30 days from the time of your deposit to gather as many poker points as you can. Whenever you amass enough of them to unlock the next segment of your bonus, the money will hit your real money balance instantly. There’s no need to complete any other playthrough obligations once this free bonus cash appears; it will be completely unrestricted. The poker points that you gather while trying to earn your bonus have another purpose as well. You can save them up and then trade them in for complimentary tourney entries. The tickets range from $2.20 – $270, so there’s something for high-rollers as well as newbies. All poker points become invalid after a year and a half of account inactivity, so don’t forget to use them up before you leave. If you start to play at Bovada Poker and think it’s excellent, then why not share it with your friends? For everyone who signs up with the company by following your own personal affiliate tracking link, you’ll get a bonus of 200% up to $100 on the money that person deposits. 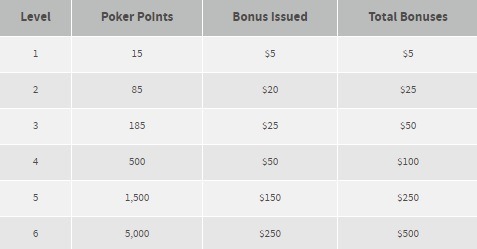 You must play enough to gather 6 poker points per dollar of this bonus before the sum is considered yours to keep. You’ll notice one option that’s supported both for deposits and payouts: the digital crypto-currency Bitcoin. In general, this is the best way to move money around online for poker. It has quite reasonable fees, and it allows you to avoid delays when it’s time to request your money. 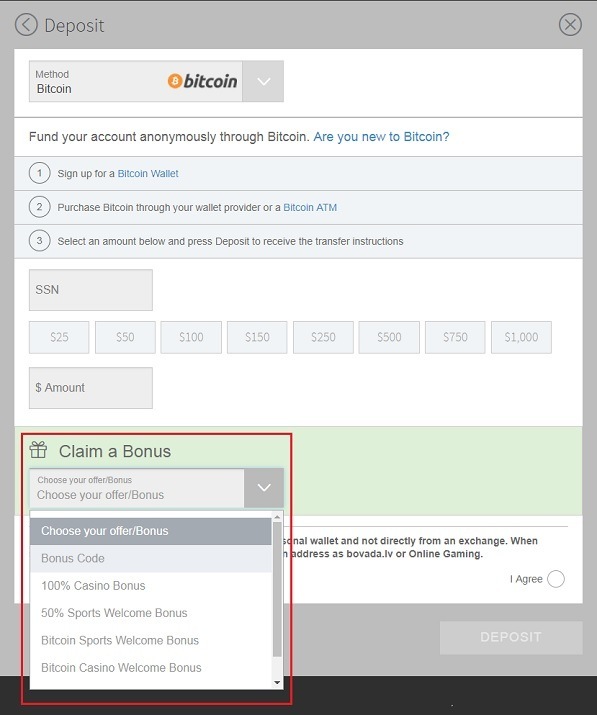 Other withdrawal channels come with significant fees at Bovada, apart from one free cashout every 90 days, but Bitcoin transfers are always free. For cash game enthusiasts, Bovada spreads NLHE, PLO, and PLO/8 from $0.02/$0.05 all the way up to $10/$20. Limit Hold’em and Limit Omaha-8 are also offered as high as $30/$60. If you’d rather play sit n’ go’s, then you’ll be pleased by the range of games from $1 + $0.05 up to $200 + $14. 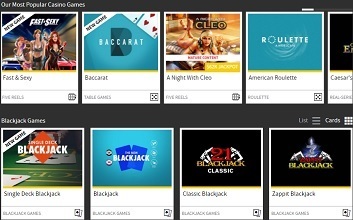 Multi-table tournaments are denominated across a broad spectrum of buyins. The most inexpensive competitions in the normal roster require you to pay just $1 + $0.10 while the most costly will set you back $250 + $20. However, bigger MTTs occur sporadically particularly as part of a series. No personally identifying information is shown about any customer at the Bovada tables. Instead, people are labeled “Player 1,” “Player 2,” “Player 3,” and so on. This lets you play however you want without having to worry about anybody tracking your game over a long period of time. Although a few pros bemoan the fact that their favorite database and HUD tools don’t work here, for the average player, this creates a comfortable poker environment. 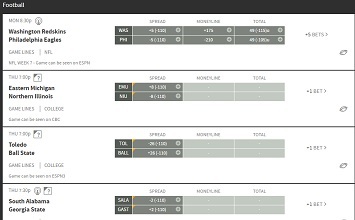 It’s no coincidence that Bovada is known to have some of the softest games on the internet. If regular cash game poker is too slow for your tastes, then jump into the brisk action of Zone Poker. There are no static tables or seats in Zone. Instead everyone is constantly moving around because whenever anyone folds a hand, they’re transported within a few seconds to another table to start a new hand. You can see hundreds of hands per hour in a Zone pool – perfect if you’re trying to clear your 100% up to $500 bonus. NL Hold’em Zone reaches up to $1/$2 while PLO players can join up to $0.10/$0.25. With your smartphone or tablet, you can log into the Bovada mobile poker room and play whatever cash games you want, including Zone. It’s compatible with iOS, Android, and really almost every other mobile operating system because it uses a web-based interface rather than a downloadable app. Unfortunately, tournaments and SNGs are not present on the Bovada mobile solution. 24 hours after a hand finishes, you can download the hand history for it, and you’ll be able to see what the other players’ cards were! This is made possible by the anonymous features of Bovada, which permit you to view this information without gaining an unfair insight on how any other individual plays. Every Sunday at 4:00 p.m. ET, Bovada hosts the $100,000 Guaranteed event. It costs $150 + $12 to enter, but you don’t have to pay full price. There are satellites running throughout the week, and some of them have buyins as low as $1. Whether you’re a baller or a rookie, this tourney is for you. $100K is a lot of dough, but Bovada recognizes that there are some who want the opportunity to play for much more. Therefore, the site runs several tourney series throughout the year, including the Black Diamond Poker Open and the Golden Spade Poker Open. Whenever one of these series appears on the schedule, get ready to test yourself in many formats of poker and compete for your share of millions in prize money. Need a break from poker? Well, Bovada has got you covered with a fully featured sportsbook, a casino that contains hundreds of games, and a racebook for betting on the horses. Read our Bovada Sports review and our Bovada Casino review to learn more about these highly rated Bovada products. 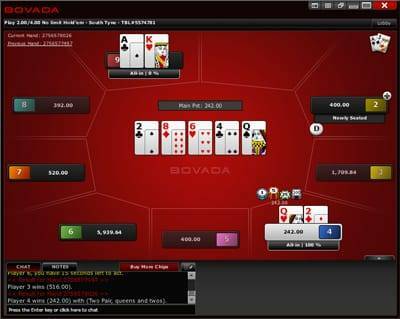 Although Bovada is a big name in U.S.-facing online poker, there are sadly a few areas from which it does not accept customers. Nobody from Delaware, Maryland, Nevada, New Jersey or New York can register to play for real money. A $500 Poker Bonus Is Yours! 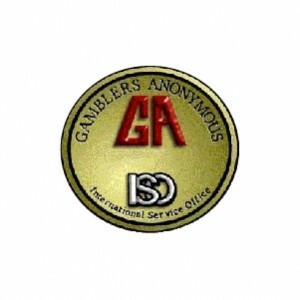 Read more about Bovada Poker here at GPSTS.org.